In recent years, as cities across the Sun Belt embraced urban-style projects featuring a mix of uses, this vast city sat quietly on the sidelines. Now Houston is making up for lost time. More than a half-dozen high-profile developments mixing residential, retail and office space are either under way or planned here. The projects, which promise well over $1 billion in development, underscore a fundamental shift in the development patterns of a city that has long preferred sprawl to density. And they mark a significant breakthrough for the increasingly popular concept that developers pitch as "live, work, play." A desire to walk more and drive less is in part responsible for the proliferation of mixed-use projects, as is a broader national trend toward urban living. Houston's economy is also a factor. Buoyed by the oil and gas industry, job growth is up while office and retail vacancies are down. Meanwhile, the region's population grew at more than double the national rate in 2006 from a year earlier, to 5.5 million. Today's mixed-use developments are rooted in the rise of New Urbanism, a movement of architects and planners dating to the 1980s that calls for a return to traditional towns. Such developments are more challenging to create than shopping malls, especially in urban cores, where land can be difficult to assemble. But they have proved popular in cities such as Atlanta, Dallas and Denver. Much of the article has details on several of the projects, many of which are listed in this graphic (click on it to see a sharper version). A larger starting base of young professionals, although Houston has seen a strong surge in this population along with the recent oil boom. Now people are talking about the generation gap in energy companies: a lot of 45-and-overs + now a lot of fresh college grads, because few people went into the business in the 20 years from 1984 to 2004. Those tighter land-use controls in other cities helped limit competition, reduce risk, and improve profitability. Houston developers had to wait until the "pent-up demand" was strong enough on its own, without government help. In the long-run, we should get more of it, and at a lower price, than we would in a more tightly controlled environment. Go mega-big to be super high profile. That gives you lots of power with local politicians and regulators, getting you the land assembly and variances you need - maybe even tax breaks and public infrastructure. Knowing you can't fill everything in such a gigantic project immediately, plan to phase it out over many years, staying just ahead of demand. Being high-profile means the powers-that-be don't want to see you fail, because the bad PR will reflect badly on them and the city. They also want to see you fully built-out as soon as possible. They'll take subtle and maybe not-so-subtle actions to limit competitors, usually via zoning and permitting limits, channelling demand into your project. This protection allows you to price your stuff very profitably, but of course that keeps many potential buyers out of the market. Competition increases supply (and variety), lowers prices, and increases demand. It's probably no surprise to you that I think Houston's more wide-open approach is a better way to go. And, based on this article, it looks like our patience is really paying off. The Greater Houston Partnership is pleased to host Joel Kotkin, one of America’s foremost urban historians. Mr. Kotkin will introduce his new study Opportunity Urbanism: An Emerging Paradigm for the 21st Century. He will discuss his research on urban trends and challenges and will introduce his concept of “Opportunity Cities” as the predominant model for America’s urban future. If you'd like to attend, the registration information can be found here. Hope to see you there! Most Houston place, $ for parks, strong housing, wireless problems, toll roads, transit networks, and vote for Houston! Time again to clear out the miscellaneous small items of interest. I also would like to announce that work has gotten so busy that I think I'm going to have to drop down from 3 posts/week to 2 posts/week, probably on Sunday or Monday nights, and Wednesday or Thursday nights, depending on what's going on in a given week. If you check in Tuesdays and Fridays, you should catch 'em. Or better yet, sign up for the RSS feed. I recently found The Most Houston Place in the Universe. 1. Diversity, particularly the off-handed, easy kind that seems astounding only when you stop to think about it. 2. Drive, as in the drive to succeed, accompanied by the belief that anyone who works hard here can make it. 3. And driving. The kind you do in your car. Being a good Houstonian, I then got in my car and drove around. Her answer: Veteran's Memorial in northwest Harris County, out by 1960, which I think is a pretty good choice - even if it technically is not inside the city. Read the whole thing for the reasons why. Another "don't miss" from the Chronicle on a proposed developer fee/requirement to purchase open space and parkland. Makes a lot of sense as long as it's not too onerous. Don't forget that a lot of these new inner-loop townhome/condo buyers are recent college grads that have pretty tight limits on what they can spend for a home. Hopefully land costs will adjust flat or slightly downwards so final home prices stay roughly the same even with the new fees/requirements. Update: just caught a Wall Street Journal article that notes "city planners generally use 10 acres of parkland per 1,000 people as a rule of thumb for necessary green space." The Chronicle article says we already have 16.5 acres per thousand. Not that a few more acres wouldn't be nice, but we seem to already be in pretty good shape in this department. A Wall Street Journal article on cities that are bucking the national housing downturn includes Houston as well as Seattle, Salt Lake, Portland, Boise, Charlotte, Raleigh, and Austin. Reason's Bob Poole on the toll road transportation debate in the Texas legislature. He argues strongly for private toll roads, but I'm more on the fence. I have trouble seeing the real advantages vs. a public authority using tax-free bonds, and the potential disadvantages down the road can be frightening, because these things are essentially structured as 50+ year semi-monopolies. Imagine if I45 between Houston and Dallas had been structured as a private monopoly 40+ years ago? Talk about minting money at the public's expense. I have some other Reason reports that go into more depth on the arguments, and I'm hoping to read them soon and report back here. Christof on building the right multi-modal, interconnected transit system, using Germany as an interesting example. It makes a good argument for why our local LRT/BRT system should be separate, but connected, to our commuter system. Trying to use one system for both short-distance hops and long-distance commutes creates a mutant that is good at neither. The Urban Corridors Planning project had a meeting tonight at the GRB to present the preliminary findings from their multiple corridor workshops (coverage of previous meetings here and here). They had an interesting PowerPoint presentation (which should be on their site at some point), as well as some very detailed maps for each corridor designating potential development areas as well as preservation areas, with the goal being high-density, mixed-use, pedestrian and transit-oriented neighborhoods. Actually make the capital investments in transit, streetscapes, and public buildings. Reduce developer risk with a TOD-friendly ordinance (vs. our current suburban-only code) as well as a streamlined approvals process. Reduce developer costs with reduced parking requirements, reduced open space requirements, and financial incentives (!! - not so sure about that last one). There is some speculation it make take some TIRZ districts to make the necessary streetscape investments (wide sidewalks, trees, benches, diagonal street parking, etc.). The city may also have to get into the neighborhood public parking garage business, which has been a very successful model in other cities (especially Toronto). Overall though, I think they're on the right track, with the right manageable, narrowly-targeted scope (~2% of the city) and the right neighborhood and developer-friendly attitude (or nothing will happen). They instantly convey what the look and feel of these areas will be. Anybody who's been to Europe, or even just seen a few movies set there, will "get it." London is probably the top city in the world right now - it's not unreasonable to aspire for 2% of Houston to emulate it and the lifestyle it offers. I also considered Paris, New York, or San Francisco comparisons, but those places can create a visceral negative reaction from some people based simply on politics, which they might have trouble seeing past to the "urban feel" of those places. London is a city admired (or at least tolerated) on both the left and right of the political spectrum, and it has a similar broad diversity to Houston. If we don't want to get as specific as London, I think "Eurocity" is a nice, broad, generic, all-encompassing term that defines the character we're looking for in these corridors. If you've been to London, Paris, Amsterdam, Rome, or just about any other city in Europe (well, maybe not Venice... unless we get another Allison), you'll understand instantly the urban experience being targeted. And almost everybody who's traveled there has pretty fond memories of that experience. It's a great branding for this whole initiative that will help build the positive public sentiment necessary to push through the apathy and obstacles and really make it happen. Update: "Eurocity Corridors" could also add a coolness factor to the zone that would attract developers, businesses, and residents. Open up transit to competition by ending the govt-sanctioned monopoly, allowing competition like jitneys - an idea I've advocated for Houston before, and one that is particularly applicable to commuter services on an express lane network. Raise parking meter rates so people spend less time cruising around looking for a space. The "optimal" rate is considered to be one that keeps the street parking about 85% occupied. A better bus network, including some faster dedicated (or semi-dedicated lanes) and connecting shuttles. Synchronized lights, minimze left-turning at rush hours, and street conversions to one-way (I think the Galleria/Uptown area could really use this last one - maybe Post Oak should be one-way northbound, looping southbound on the 610 feeder?). Convert HOV lanes to congestion-priced toll lanes to get better utilization. Cut bus fares. Maybe even make them free. Fares typically cover less than 20% of costs (the rest are paid by sales tax subsidies). Free fares not only increase ridership, but vastly simplify and speed up the buses since fares don't have to be collected or enforced. Extend congestion pricing to all freeways (radical, but could be extremely effective). A really good set of suggestions. Houston seems to be on track with 3, 4, and 5. 2 is less relevant to us, but could be helpful. 1, 6, and 7 are more "out there" - but well worth investigating. Just a rushed pass-along this morning: Randal O'Toole, a sharp critic of urban planning gone awry, talks about how The Woodlands did (and does) planning right. Nice pictures too. Sorry for being a day late on the blog post. Just a quick pass along from the New York Times. Houston is one of 16 world cities that have agreed to be part of a plan to make billions of dollars of investments to make their buildings more energy efficient, as part of a solution to global warming/climate change. A coalition of 16 of the world’s biggest cities, five banks, one former president and companies and groups that modernize aging buildings pledged today to invest billions of dollars to cut urban energy use and releases of greenhouse gases linked to global warming. Under a plan developed through the William J. Clinton Foundation, participating banks would provide up to $1 billion each in loans that cities or private landlords would use to upgrade energy-hungry heating, cooling, and lighting systems in older buildings. The loans and interest would be paid back with savings accrued through reduced energy costs, organizers of the initiative said at a news conference this afternoon in Manhattan. Typically, such upgrades can cut energy use and costs 20 to 50 percent, they said. Making more efficient use of energy is considered by many scientists to be the best starting point for addressing global warming, particularly because there is a potential immediate financial payoff along with the long-term environmental benefit. Energy use in buildings accounts for about a third of global releases of heat-trapping greenhouse gases. In densely populated older cities, such as New York City and London, buildings are the dominant source of greenhouse gases. The first targets under the initiative, organizers said, would be municipal buildings in the participating cities — Bangkok, Berlin, Chicago, Houston, Johannesburg, Karachi, London, Melbourne, Mexico City, Mumbai, New York, Rome, São Paulo, Seoul, Tokyo and Toronto. The project is aimed at propelling energy-saving investments that otherwise tend not to happen even when long-term financial benefits are clear — because cities or property owners lack access to capital, organizers said. Not a bad set of company. And an initiative that makes total sense. Definitely part of the no-brainer low-hanging-fruit in the debate over and response to global warming. Update: AP version of the story. Is urban form the root of politics? Last week's post on the realignment of America, as well as this post and graphic from Richard Florida's blog on a divided America, got me thinking about urban form and political leanings. Much of the world seems to lean towards communal - or somewhat left-leaning - politics: Asia, Europe, Latin America, and the big coastal cities in the US. These places are often characterized by large, relatively dense cities. 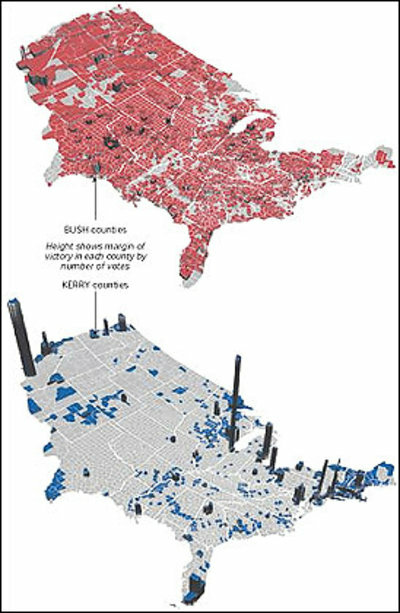 When you live in density, what your neighbor does very directly affects you, and so you're more likely to support a more active government that puts a lot of controls and planning in place. And not just land-use regulation and transportation choices, but income redistribution, because the poor and homeless are much more "in your face" in a dense city, and you naturally want somebody to do something about it. The rural, southern, and western U.S. (except for the coast), plus maybe parts of Australia and western Canada, are a little odd relative to much of the rest of the world because they have lower density - mostly car-based suburban - and lots of space. This seems to foster a more libertarian viewpoint. When all those people aren't on top of you, it's easier to be more strongly for property rights, and think, "sure, let them do what they want, and let me do what I want - no harm, no foul; live and let live." That space creates a higher tolerance for freedom (side note: we're talking economic freedom here, not social freedoms, civil rights and tolerance, which has a completely different set of dynamics where religion and ethnic identities get mixed in, among other factors). It's really no surprise, when you think about it, that 18th-century America was the first place where a nation-state based strongly on liberty was able to to take root: we had truly tremendous amounts of land relative to the population. Why not let everybody do their own thing? It's not going to impact me. But clearly this is a rare outlier in the world. Libertarianism really lacks much of a base outside of these limited geographic areas. The global population keeps growing and urbanising, creating ever more pressure towards communal politics. Even in the southern and western U.S., larger central cities seem to be moving this direction, including Houston, Dallas, Denver, and Atlanta (some faster than others). Most of these greater metros are still dominantly suburban, but the central cores are feeling the communal pressures which in turn affects the local politics. What's the future? Really hard to say. There is definitely a renewed movement towards the central cities and density. But suburban sprawl is not stopping. Most of the largest American cities are not growing much, and the domestic migration is definitely towards more mid-sized, suburban, low-density cities like Phoenix, Vegas, Orlando, Charlotte, Austin, San Antonio, and Raleigh-Durham (as the article pointed out). The internet is also enabling people to work from anywhere: some choose the inner city coffee shop, others choose an exurban estate. As I've said before on this blog, rising affluence tends to seek more private space, reducing density. But rising affluence also gets more concerned with aesthetics, and that requires more communal controls. Quite the mix of forces in play. And of course, we can see these trends playing out in Houston, as a city with a tradition of strong liberty confronts the communal pressures of a densifying core and rising aesthetic concerns. I'm hoping we find some innovative ways of maintaining our libertarian tradition (and the strengths that gives us) while addressing the new communitarian needs with creative free-market approaches, rather than just marching down the same old statist political paths of the older European and coastal cities. Atlanta has tried to reduce its traffic congestion by getting people out of their cars and onto commuter rail trains. But a policy brief by the Reason Foundation shows that Atlanta's sprawling population is ill-suited for this type of transit. To illustrate this point, Reason compares Atlanta to a European city that heavily relies on rail transit, Barcelona. Atlanta and Barcelona have both hosted the summer Olympics and in 1990 both had populations of around 2.8 million people (Atlanta has since swelled to over 5.1 million people according to Census Bureau estimates). The built-out portion of metro Atlanta was already over 1,650 square miles in 1990. In contrast, the built-out portion of the Barcelona metro area covered just 62.5 square miles (see map in study for visual comparison of the two cities). Barcelona's metro rail network has approximately 60 miles of track, nearly all of it underground, and around 120 stations. In order for Atlanta to provide its commuters with Barcelona’s level of rail transit accessibility, Atlanta would need to build more than 2,100 miles of rail tracks and 2,800 rail stations. In order for Atlanta’s density to reach 7,800 people per square mile (over 20 years with current growth trends), and taking into account the increase in population, the current built-up area would have to shrink by 64 percent. To reach 7,800 people per square mile, about twothirds of the existing real estate stock would have to be destroyed, two-thirds of the built up area would have to revert to nature and its population and jobs would have to be moved into the 36 percent of the urban area which would remain. We can safely affirm, given the likelihood of this scenario, that Atlanta will never come close to the 7,800 people per square mile density threshold required to justify an extension of transit. Thus, even when using draconian land use regulations over periods as long as 20 years, it is difficult to change the density of a large metropolitan area. Our analysis concludes that the current fashion in transportation planning—of investing heavily in mass transit, carpooling, and land-use changes to reduce the extent of driving—is not compatible with the goal of reducing traffic congestion. They also have a series of congestion reduction recommendations, including value tolling, most of which are already in the process of being implemented in Houston. There would be large benefits from implementing this approach. Valuing the time saved at a conservative $12 per hour, the time saving over 20 years would be more than $98 billion. But there would also be major economic benefits. Studies have shown that by allowing employers to recruit from a wider radius (and employees to seek jobs within a wider radius), better matches of skills with needs would occur, making Atlanta’s economy more productive. Just for the record, I think most of Metro's transit plan is much more realistic for a city like Houston. Atlanta has evidently been a bit more delusional in their visioning, thus Reason felt compelled to write the report. The Wall Street Journal had a quite long and comprehensive op-ed this morning titled "The Realignment of America" on demographic shifts since 2000 (free 7-day link, subscriber link). While getting the link, I also noted it has been one of the most popular - and the most emailed - stories today at WSJ. The graphic is pretty cool, and makes it look like everybody is headed to Texas (or maybe Arkansas?). Start with the Coastal Megalopolises: New York, Los Angeles, San Francisco, San Diego, Chicago (on the coast of Lake Michigan), Miami, Washington and Boston. Here is a pattern you don't find in other big cities: Americans moving out and immigrants moving in, in very large numbers, with low overall population growth. This is something few would have predicted 20 years ago. Americans are now moving out of, not into, coastal California and South Florida, and in very large numbers they're moving out of our largest metro areas. They're fleeing hip Boston and San Francisco, and after eight decades of moving to Washington they're moving out. The domestic outflow from these metro areas is 3.9 million people, 650,000 a year. High housing costs, high taxes, a distaste in some cases for the burgeoning immigrant populations -- these are driving many Americans elsewhere. The result is that these Coastal Megalopolises are increasingly a two-tiered society, with large affluent populations happily contemplating (at least until recently) their rapidly rising housing values, and a large, mostly immigrant working class working at low wages and struggling to move up the economic ladder. The economic divide in New York and Los Angeles is starting to look like the economic divide in Mexico City and São Paulo. Democratic politicians like to decry what they describe as a widening economic gap in the nation. But the part of the nation where it is widening most visibly is their home turf, the place where they win their biggest margins (these metro areas voted 61% for John Kerry) and where, in exquisitely decorated Park Avenue apartments and Beverly Hills mansions with immigrant servants passing the hors d'oeuvres, they raise most of their money. You see an entirely different picture in the 16 metro areas I call the Interior Boomtowns (none touches the Atlantic or Pacific coasts). Their population has grown 18% in six years. They've had considerable immigrant inflow, 4%, but with the exceptions of Dallas and Houston, this immigrant inflow has been dwarfed by a much larger domestic inflow -- three million to 1.5 million overall. Domestic inflow has been a whopping 19% in Las Vegas, 15% in the Inland Empire (California's Riverside and San Bernardino Counties, where much of the outflow from Los Angeles has gone), 13% in Orlando and Charlotte, 12% in Phoenix, 10% in Tampa, 9% in Jacksonville (doesn't it touch the Atlantic coast?). Domestic inflow was over 200,000 in the Inland Empire, Phoenix, Atlanta, Las Vegas and Orlando. These are economic dynamos that are driving much of America's growth. There's much less economic polarization here than in the Coastal Megalopolises, and a higher percentage of traditional families: Natural increase (the excess of births over deaths) in the Interior Boomtowns is 6%, well above the 4% in the Coastal Megalopolises. The nation's center of gravity is shifting: Dallas is now larger than San Francisco, Houston is now larger than Detroit, Atlanta is now larger than Boston, Charlotte is now larger than Milwaukee. State capitals that were just medium-sized cities dominated by government employees in the 1950s -- Sacramento, Austin, Raleigh, Nashville, Richmond -- are now booming centers of high-tech and other growing private-sector businesses. San Antonio has more domestic than immigrant inflow even though the border is only three hours' drive away. The Interior Boomtowns generated 38% of the nation's population growth in 2000-06. What about the old Rust Belt, which suffered so in the 1980s? The six metro areas here -- Detroit, Pittsburgh, Cleveland, Milwaukee, Buffalo, Rochester -- have lost population since 2000. Their domestic outflow of 4% has been only partially offset by an immigrant inflow of 1%. If the outflow seems smaller than in the 1980s, it's because so many young people have already left. Natural increase is only 2%, lower than in Orlando or Jacksonville in supposedly elderly Florida. Their economies are ailing, more of a drag on, than an engine for, the nation. They're not the source of dynamism they were 80 or 100 years ago. The fourth category is what I call the Static Cities. These are 18 metropolitan areas with immigrant inflow between zero and 4%, with domestic inflow up to 3% and domestic outflow no higher than 1%. They seem to be holding their own economically, but are not surging ahead and some are in danger of falling back. Philadelphia makes the list, and so do Baltimore, Hartford and Providence in the East. Surprisingly, some Western cities that boomed in the 1990s are in this category too: Seattle (the tech bust again), Denver, Portland. In the Midwest, Minneapolis, St. Louis, Cincinnati, Kansas City, Columbus and Indianapolis are doing better than their Rust Belt neighbors and make the list. In the South, Norfolk, Memphis, Louisville, Oklahoma City and Birmingham are lagging enough behind the Interior Boomtowns to do so. Overall the Static Cities had a domestic inflow of just 18,000 people (.048%) and an immigrant inflow of 2%. Twenty years ago political analysts grasped the implications of the vast movement from Rust Belt to Sun Belt, a tilting of the table on balance toward Republicans; but with California leaning heavily to Democrats, that paradigm seems obsolete. What's now in store is a shifting of political weight from a small Rust Belt which leans Democratic and from the much larger Coastal Megalopolises, where both secular top earners and immigrant low earners vote heavily Democratic, toward the Interior Megalopolises, where most voters are private-sector religious Republicans but where significant immigrant populations lean to the Democrats. House seats and electoral votes will shift from New York, New Jersey and Illinois to Texas, Florida, Georgia, Arizona and Nevada; within California, House seats will shift from the Democratic coast to the Republican Inland Empire and Central Valley. I've noted before that Houston is one of the few top mega-metros still growing and attracting substantial domestic *and* international immigrants, which is part of what makes us such a dynamic, diverse melting pot of opportunity. Really a fascinating time to be here and watch all the change. 83% of residents said Houston is a "much better" or "slightly better" place to live than other U.S. metros (up from 78% in 2005). That's some pretty impressive pride and happiness in our city. I like Dr. Klineberg's point that Houston has the most demographic balance between the four major ethnic groups (Anglo, Black, Hispanic, Asian) of any major U.S. city, and that we are 30-40 years ahead of the demographic trends in the rest of the country as a whole (i.e. it'll take that long until the U.S. demographics match what Houston has today). When asked the question, people visualize the perfect transit solution magically appearing for them, one that goes from right near their house right to their job zipping past all the traffic. Not realistic. Since most real transit routes tend to end up slower than driving, they don't actually get chosen much when it comes to real-life personal decisions. They visualize everybody else taking transit to free up the roads for them, like The Onion headline classic "98% of commuters support transit for others". We've just escalated from "not realistic" to "pure fantasy." They don't understand the cost-benefit tradeoffs involved, which usually favors roads when it comes to really moving the most people at the least cost. If you asked them instead, "Should public transportation dollars be spent in the most cost-effective way to move the most people for the least money? ", then you'd get a pretty overwhelming consensus. This question seems to have biased wording to me: "Need better land-use planning to guide development, or leave people free to build wherever they want?" Clearly designed to get people to choose the first one, with loaded words like "better" and "guide" - and the second one almost whispers "chaos" into your ear. Wanna bet we'd get a polar opposite response if we phrased the question, "Should you or the government control the development of your land?" Here's a more neutral wording replacement I would suggest: "Should land-use decisions be made by the free market or government planning?" Still, overall a great source of information, trends, and history of attitudes in Houston. I highly recommend reading it in more detail if you get a chance. Last week I was able to attend a Livable Houston presentation by Kari Hackett of the Houston-Galveston Area Council on the preliminary 2035 Regional Transportation Plan, a process they go through every 5 years. I thought I'd cover a few highlights that jumped out at me. The finished map is an amazingly comprehensive loop-and-spoke freeway network, with the potential for congestion pricing on everything except 610 (that means the tollways plus the managed lanes on the "free" freeways). Still, as impressive as it is, evidently it's 210 fewer lane miles than the 2030 plan. It's also 3,050 fewer lane miles of "smart street" arterials. It was unclear why lanes were subtracted: reality of RoW costs, pushback from cities/neighborhoods, etc. I'm not sure whether the subtraction is a good or bad thing. The final congestion forecast map is still a pretty scary looking big red blob. Along what looks like the 288 median from Brazoria into downtown. Not sure how that jives with the toll road plan down the middle (which is also on the map). The plans I saw way back said any rail that direction would be in the Almeda corridor, but that's not what this map shows. West along I10 from downtown to Katy. Again, not sure about where the RoW is coming from here. They also still show the managed lanes along this corridor, so it's not coming out of them. Commuter rail to Clear Lake (and possibly beyond), Pearland (a surprising new one), and along 290 - as well as along 90a in SugarLand, but, get this, instead of coming in to the south end of the Main St. LRT, it turns up the freight tracks parallel and just inside the West Loop, connecting into the 290 line before arriving at the intermodal center north of downtown. I think this is the theory: commuters from Ft. Bend will transfer to the Bellaire GRT to get to the med center, they will have reasonably easy transfers to Greenway and Uptown, and then they come into the the downtown intermodal - so they'll effectively serve 4 job centers instead of just the med center, as connecting to the south end of the LRT would do (30 mins is too long a connecting slog to downtown along the entire length of the Main St. line). It makes a lot of sense. In fact, all the proposed commuter lines seem to have better connections into the 4 major job centers in the core. A definite improvement, although overall expected cost-effectiveness vs. express buses remains to be seen. An "Envision Houston" scenario with more concentrated density in the urban core around mixed-use, pedestrian "Livable Centers" that is forecast to increase transit use about 20% and reduce vehicle miles-travelled by 6%. There is expected to be a public meeting on June 14th if you'd like to know more. Details to be announced. The Pittsburgh area was ranked as the nation's second most polluted metropolitan area followed by Bakersfield, Calif., Birmingham, Ala., Detroit and Cleveland. Visalia, Calif., Cincinnati, Indianapolis and St. Louis rounded out the top 10. On the downside, we're still not doing so well: a grade of F for ozone, and a C for particulates. If it's any consolation, other Texas cities aren't much better, and Dallas is actually worse for particulates (I think our frequent rain helps). Flipping back to the positive side, recent HGAC model forecasts I've seen say we should be able to get in compliance with federal air quality standards within the next year, and get further and further underneath their standards in future years. Let's hope the models are right. Boomtowns and Texas have often gone hand in hand. Now, buoyed by high energy prices, a rebounding tech sector, and an influx of educated newcomers from the U.S. and abroad, the Lone Star State’s economy is booming once again. Just look at the big movers on Inc.’s annual survey of the nation’s boomtowns. Among large cities, Dallas soared 18 spots, to No. 25 among the 65 large cities measured; Houston climbed 14 places, to No. 17; and Austin shot up 10 spots, to No. 16. Among small and midsize cities, McAllen, Midland, and Laredo posted similarly strong gains. “Everything is hitting on all cylinders,” says Bill Gilmer, an economist with the Federal Reserve Bank of Dallas. Vegas and Phoenix are still #1 and #2 based on sheer growth. Seems that everybody in California wants to sell their house at the peak and move just a bit east for the (relatively) bargain homes. Other regions are slipping. San Diego; Santa Ana-Anaheim, California; and Nassau County, New York, all took tumbles from last year. There’s no such softening in Texas. Gilmer ascribes the state’s strong showing to several factors, including relatively low business costs, a recovery in technology—and most important, the thriving energy sector, which is attracting a new cadre of highly paid professionals to an increasingly sophisticated high-tech business. Job growth in Austin, hit hard by the dot-com bust, is now more than triple that of rival high-tech centers like Boston (No. 56) and San Jose (No. 60). Joel always gives great speeches on the history and trends of cities. If you'd like to catch him on his next visit to Houston, he'll be at the HBJ Celebrate Enterprise event later this month (tickets). UPDATE: A clarification from Karl in the Mayor's office on our air pollution status in the comments.